Organic dairy products, at 15% of the U. S. organic market, are second only to fresh fruit and vegetables in sales. 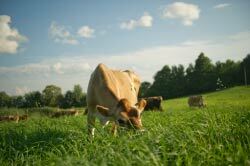 The northeast, with our cool seasons, plentiful rainfall, abundant pastures, and hilly (even rocky) terrain, is ideal for dairy farming. The presence of so many nearby population centers makes small, specialized, value-added and raw milk dairies financially possible – in some cases even attractive. [Read more…] about Why Organic Dairying? A ewe waits as her lamb at Northland Sheep Dairy is about to nurse. The average American consumes almost 68 gallons of cow milk in the form of fluid milk and milk products, and milk ranks amongst their top four consumed beverages (not including tap water). These and other statistics show that milk is a ubiquitous part of our cultural diet. How cultural, how-ever, is knowledge about the average dairy cow’s life? Recently, while visiting at a neighbor’s house following evening milking chores, I was amused by their four-year-old son’s response to learning that I had spent the last few hours milking cows. “Milking the….cows! ?”, he replied in shocked amazement. I’ll chalk this one up to being a four-year-old, but must also acknowledge a study published in the U.K. in 2012 by LEAF (Linking Environment and Farming). In their study only 6 out of ten participants between the ages of 16-23 were able to successfully link milk to a photo of a dairy cow. Knowing the cow (or goat or sheep) as the origin of milk is an important first step in agricultural literacy. In promoting agri-cultural literacy and consumers that are actively making conscious food decisions, however, we must also be educating about the concepts of animal welfare, behavior and nutrition, as well as the daily routines and management decisions of farmers. It is an easy step to be a part of a culture that embraces a product but it is a vital step to be a part of a culture that knows the story of the product’s origins. New York’s Cortland County, just south of Syracuse and east of Ithaca, is stunningly beautiful in the spring. Rolling hills with their broad expanses of grassy pastures, treed hills and cultivated bottomlands are dotted with modest farmhouses and outbuildings. In May, when I traveled these roads, the trees and bushes were in peak flower and the promise of fruitfulness was everywhere. A sign that the local food movement has penetrated to this farming heartland is a new grocery store in the city of Cortland, the county’s seat and largest municipality at under 20,000 souls, called The Local Food Market. They have contracted with a local organic grower to provide their produce. 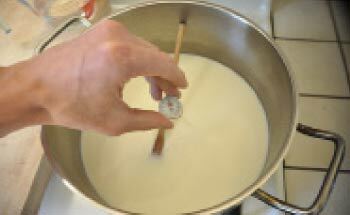 Dairy products such as yogurt, kefir, and cheese result from similar processes. Outcomes that range from soft and spreadable quark to hard grana-style cheeses like Parmigiano–Reggiano DOP (Protected Designation of Origin in Italian) result from variations in process time, process temperature, and the selection of microbiological cultures. 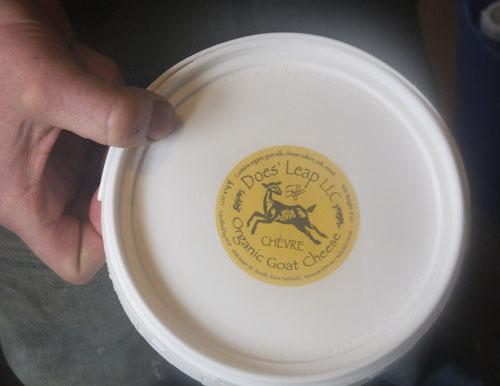 While the constancy of dairy products made by large cheese plants and skilled artisans is difficult to achieve at home, it is possible to make good versions of most dairy products with simple tools. After all, fermented dairy products predate the complex equipment and manipulations now common in milk processing. Temperature control during milk processing is critical. change with temperature. Always keep milk in gentle motion while heating it. Cheese, yogurt, and kefir all begin as milk, yet they finish with dramatically different appearances, textures, aromas, and flavors. Each variation represents a particular decision made along the way during processing. Home processors will find that while recipes for making yogurt, kefir, and cheese are helpful guides, the best way to develop reliable methods is over successive attempts. It helps to keep records of each batch so that the next effort can be just slightly tweaked to influence the outcome. Swanton, Vermont, is about as far northwest as you can go in Vermont without ending up on that funny little peninsula that sticks out south of Quebec into Lake Champlain. The soil is straight alluvial deposits from the lake, and flat as a tabletop. Rumor has it that this was not a bad place to live, a stone’s throw from Quebec, during Prohibition. 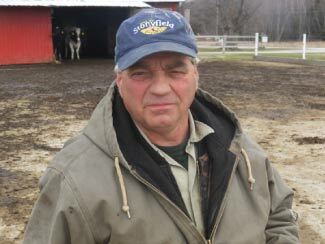 The Fournier family goes back four generations in Swanton and Earl, current owner of the family dairy farm there, jokes about their bootlegging days. His father, Rene, still owns and operates a farm equipment company in town, and Earl runs the farm with the help of his wife and 39 and 22 year-old sons. In the early days of the organic label, there was the enthusiasm of creating a new type of farming, which some saw as an alternative to the mainstream corporate chemical agriculture, and there was an ability for these pioneers to make a reasonable living from organic dairy as the buyers they were working with understood the economics of organic dairy and were eager participants in its growth. 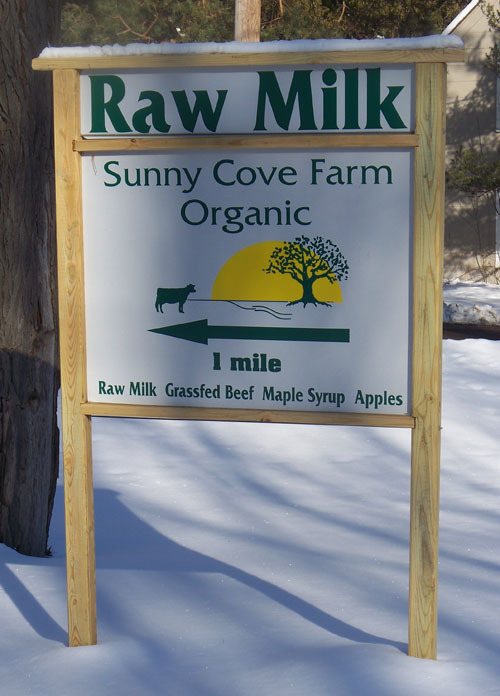 Now the two national brands that effectively set the pay price view organic dairy through the lens of a corporation or a traditional cooperative where the interest of the company/cooperative precede those of the farmer, rather than working together. Organic dairy has matured and there is the need to think about how to attract the next generation of organic dairy farmers who may not want to work seven days a week; who see good health insurance as an entitlement; vacations and the ability to send their children to college a necessity; and to have enough profit to establish a retirement fund that is not based on selling their land and livestock. Northern Vermont has always had a special appeal to the rugged among us. Winters there are not casual; one has to be prepared for isolation, cold, self-reliance. Good jobs are not plentiful. Besides the school and town, employers tend to be small and frugal. Yet the benefits of settling there are many. Land is relatively less expensive than it is farther south, and the less attractive marks of civilization – power lines, billboards, railyards, strip malls, pipelines – are fewer and farther between. It was to Bakersfield, about an hour northeast of Burlington, that George and Kristin Van Vlaanderen turned in 1997. They had just finished grad school in the University of Maine Sustainable Agriculture program in Orono, Kristin’s family was from Fletcher, the town next door, and 130 acres of mostly hillside, wooded land was available for a price that wouldn’t break the bank. They had a dream. As a 12 year old boy, I found myself walking down the road ½ mile every weekday after school to my uncle’s dairy farm to help with the afternoon chores. In 1966 dairy farms of 20-40 cows surrounded the countryside where I grew up in Upstate New York: I was one of many young people who would learn to work making hay, milking cows, feeding calves, pitching manure, boiling sap, driving tractor, and all the other jobs required on rural American farms. My own father had milked cows on our farm until I was 5 years old, but he had 4 kids to feed and the price of milk dropped from $4 to $2/cwt. With the added requirements of installing bulk tanks (instead of the old milk can cooler), drinking cups, gutter cleaners, and a new milk house, he sold the milking cows and found more profitable work to support his family.